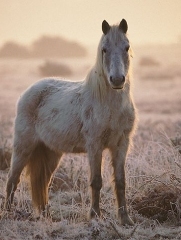 The white pony was born with a single horn and the people called her "unicorn". Legend tells that she could preserve the yin, and harmonize ying and wei qi with her magical abilities. When the tribes began going to war with each other her appearance alone was able to calm the LV of the angry warriors, and to alleviate their pain and stop their spasms. When the queen fell ill with uterine bleeding they called the white Unicorn to nourish her blood and regulate her menstruation. The white unicorn hated the witch Li Lu (incompatible with Li Lu) because Li Lu wanted to banish the unicorn to the icy tundra which would cause (cc: deficient cold).